The Knights Templar were known as the original Christian warriors and were considered to be the special forces of the Crusades. They were armed with swords and armor, as well as Europe’s wealth. Their original mission was to ensure the safety of Christian’s who made their pilgrimage to Jerusalem. The organization was founded in the aftermath of the First Crusade of 1096, was endorsed by the Roman Catholic Church around 1129 and existed for approximately two centuries. The Order became a favored charity throughout Christendom and grew rapidly in membership and power. 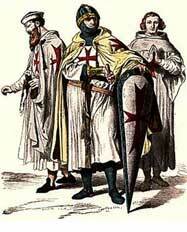 The Templar knights wore distinctive white mantles with a red cross. They were the most skilled fighters of the Crusades. The non-combatant members of the Order managed the economic infrastructure throughout Christendom, introducing financial techniques that became an early form of banking. King Philip IV of France was deeply indebted to the Knights Templar Order, but lost trust in the Order upon hearing rumors of their secret initiations. When the Holy Land was lost, support for the Order began to lose effectiveness and King Philip IV of France began to pressure Pope Clement V to take action against the Knights Order. In 1307, many of the Order’s members in France were arrested, tortured into giving false confessions and then burned at the stake. In 1312, Pope Clement, under continuing pressure from King Philip, disbanded the Order. The abrupt disappearance of a major part of the European infrastructure gave rise to speculation and legends, which have kept the “Templar” name alive today. On March 19, 1314, Jacques de Molay who was the Grand Master of the Knights Templar was said to have cursed King Philip and the Pope Clement while being burned at the stake. The tale goes that the curse asked both Philip and Clement to join Jacques within a year. Oddly enough, Clement died one month later and Philip IV died seven months after that.